On a dull Sunday afternoon, while I was browsing Nykaa website and I came across these glitter packed bottles and just couldn’t take my eyes off it. 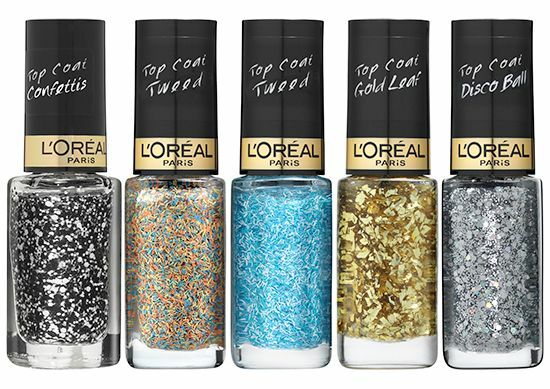 These are the newly launched glittery top coats from L’Oreal Paris. Do you remind you of Maybelline Color Show Glitter Mania Collection or it is just me? Anyways, read on to know more about it. L’Oréal Paris introduces glamour in a bottle with Color Riche Les Top Coats that will let you reinvent your nails. The new range gives the nail a unique texture and high shine finish. It’s play time with the Color Riche Les Top Coats range. From subtle Tweeds to party Disco ball to alluring Confetti to luxurious Gold, now dress up your nails, customize and accessorize them with seven fantastic textures to choose from. Be the lady you have always wanted to be! Adorn your fingertips with a little tweed jacket of their own. Choose from subdued Jackie Tweed Top Coat, Grace Tweed Top Coat and Coco Tweed Top Coat. Bring your nails to the party! Transform your nails into a luminous multifaceted disco ball with Color Riche Disco Ball Top Coat. Make your nails worth millions with real gold leaf suspended in a polish for 24 carats of luxury with Color Riche Gold Leaf Top Coat. Perfect for application on top of your favorite L’Oreal Paris nail paint, the stunning Color Riche Confetti Top Coat and the beautiful Color Riche Matte Top Coat are the perfect finishing touch to get your nails noticed. With such a great choice of top coats, it’s hard not to have fun with your nails. Whether you prefer a sparkly gold look, cool tweed or fancy disco ball, there’s a top coat waiting just for you!